Have you ever longed for a few days without computers, television, do-everything phones and devices? It seems ironic that most luxury getaways offer to keep us plugged in and turned on, even when we’re paying a bundle to get away from life’s constant demands on our time and attention. What could be a greater luxury than to disconnect from the cyber world and reconnect with the natural world we’ve nearly forgotten? Thanks to our country’s protected mountain wilderness areas, it’s still possible to get back to basics—and to remember that we were once, not so long ago, creatures of the earth who used more parts of our bodies than just our thumbs. My favorite luxury getaway is one where the only sound of civilization is the distant murmur of a commercial jetliner passing overhead. And speaking of travel, the mode of transportation in the wilderness is as basic as it gets. It’s called walking, and requires nothing more than a well-fitting pair of boots and proper socks designed for hiking. The movie Wild, starring Reese Witherspoon, does a great job of demonstrating the problems encountered with incorrect footwear. Hiking accessories can be minimal, with everything necessary fitting in a backpack. Again, Witherspoon’s character went far overboard with her pack. 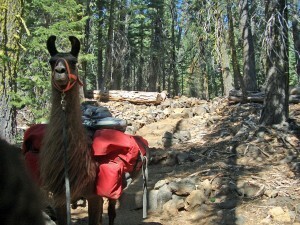 With the load she carried, she should have taken along a llama or two. Be cautioned that there will be no maid service. Wilderness hiking requires that visitors leave their accommodations as pristine as if they were never there. 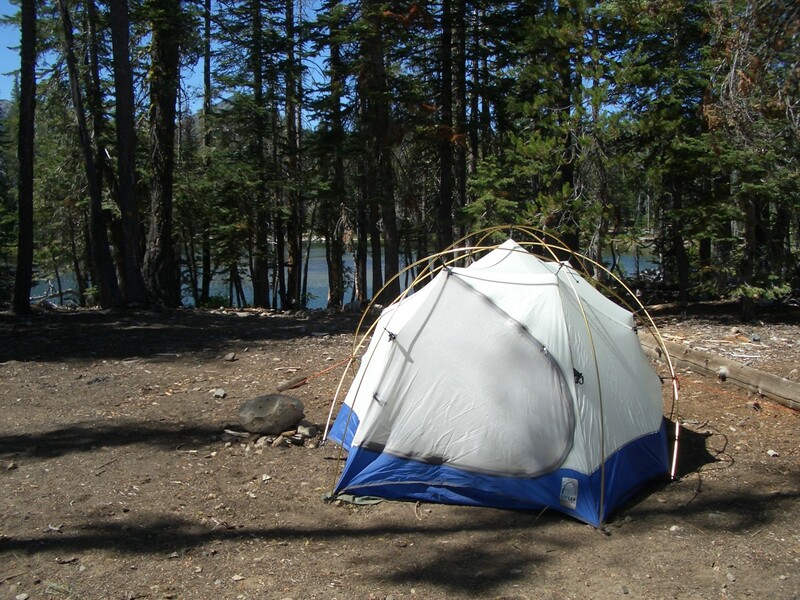 Nothing is more disheartening than arriving at a campsite and seeing empty beer cans and cigarette packs scattered on the ground. Fire rings should be dismantled, and broken fishing line, particularly dangerous to wildlife, should be packed out along with all other trash. Dogs may be allowed on your trip, but check ahead to be sure. 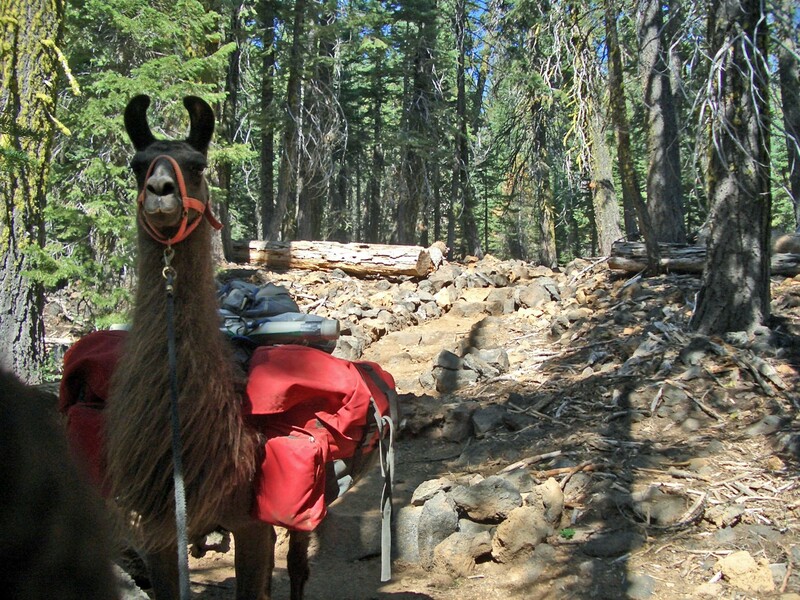 Outdoor outfitters sell doggy backpacks, so Rover can carry his own food, water, and bedroll. If your dog does come along, check leash requirements. Owners who do not respect these rules may be subjecting their animals to a heap of trouble. Dogs who spook passing llamas or horses on the trail could end up the victim of a vicious kick severe enough to spoil the outing. 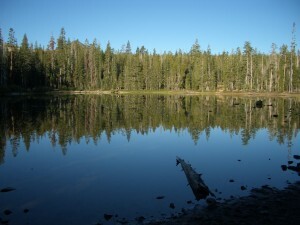 All in all, the preparation involved in wilderness hiking is well worth it when the destination is reached. There’s a special joy in sitting on a fallen log after a dinner of fresh trout, sipping hot cocoa while watching moonlight rippling on a clear mountain lake. No TV, no Internet, just human to human communication around a glowing campfire. Ahh . . . time to book a trip. Checked Out, the second book in the Aimee Machado Mystery series, finds Aimee and Nick llama packing in the northern California wilderness to track down a witness to murder. Due for release in October, 2015. We’ve all heard stories about the little boy who cries all the way through his first haircut. Our three-year-old was no exception . . . except he’s a llama. Before we bought Quartz, he had never been introduced to electric shears. Now he was confronted with a big, strong stranger with a mysterious tool that made a very scary noise. The poor llama obviously believed he was about to be killed. 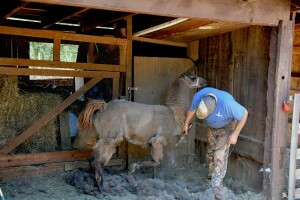 Shearing is important where we live. Our summer heat is not something you want to endure while wearing a thick wool coat. The heat came early this year, and the man who shears our animals had a long list of customers ahead of us. When he called to say he was available, we said, “Come on over.” The job needed to be done, in spite of our doubts about how our new boy would handle his first haircut. So what did our three-year-old do? He cried. He spit. He cried some more. 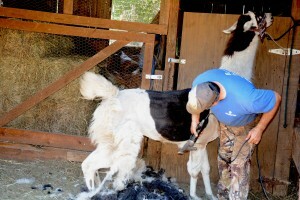 Our shearer finally decided to put a blindfold over the llama’s eyes, hoping that would calm him. It did help, and when the job was done, Quartz was much cooler and far more comfortable. Except for the aftertaste of spit that kept him drooling for half an hour. Smoke, our older, more experienced llama,had been standing by watching the drama of the first haircut unfold. Hard to know what he was thinking. Some people don’t believe animals think, but I disagree. In any case, when Smoke’s turn came, he knew the ropes, both literally and figuratively, and maintained his dignity throughout his own wool removal.